Nature excursions include a visit to Cardinal D's Park just outside George Town, where more than 60 species of exotic birds such as native Cayman parrots, blue iguana and rabbit-like agoutis can be found, as well as whistling ducks and miniature ponies. 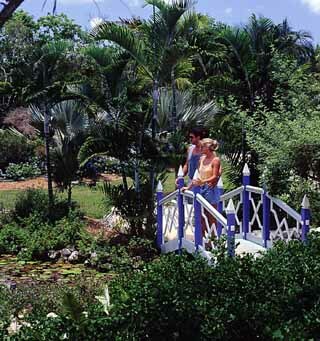 Queen Elizabeth II Botanic Park consists of 65-acres of Caymanian flora, history and beauty. The Park has a Heritage Garden, Floral Color Garden, Nature Trail and an Iguana Habitat. Approximately 50 percent of Grand Cayman's native plants can be found naturally in the Queen Elizabeth II Botanic Park. This is a must visit for those that are interested in heritage, history and horticulture. A kitchen garden is planted around a traditional Caymanian household. The park's woodland trail includes trees and shrubs only indigenous to Cayman. The completed pond restoration serves as a breeding area for water fowl and woodland birds. The Woodland Preserve is 40 acres of a natural state with walking trail. It is estimated that 40% of Grand Cayman's native flora is growing in the Woodland Preserve and the Woodland Trail passes through a wide variety of habitats and plant communities. Visitors will see seasonally flooded Buttonwood swamps; fresh water ponds; Mahogany forest; cactus/agave thickets; native palms including the endemic Coccothrinax proctorii; grassy meadows; and many epiphytic orchids, bromeliads, ferns and cacti. Much wildlife is also found in the preserve including fresh water turtles, lizards, agoutis, land crabs, butterflies, the endemic Blue iguana and the endemic subspecies of the Cuban Parrot. The Booby Pond is the largest known breeding colony of the Red Footed Booby and only breeding colony of Magnificent Frigate Birds in this hemisphere The Booby Pond Nature Reserve is now under National Trust protection. 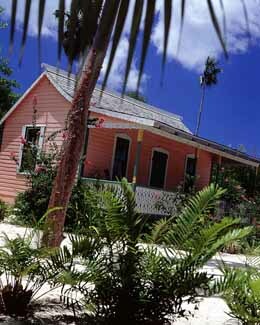 The Trust House is a Caymanian-style building overlooking the rookery which serves as the headquarters for Little Cayman National Trust. It also provides an observation deck with a high-powered telescopes for year-round bird watching. 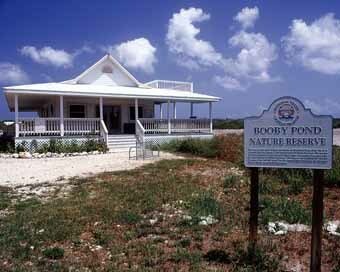 The Little Cayman Museum is located across from the Booby Pond Nature Reserve. 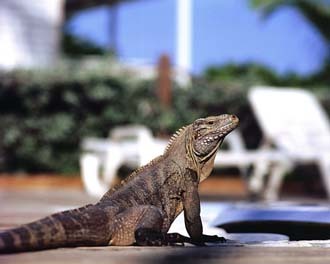 There is a Little Cayman Rock Iguana population which is estimated at some 2,000. The Booby Pond Reserve is a site made up of some 204 acres, a saltwater pond and surrounding mangrove habitate of natural rookery. There are approximately 3,500 nesting pairs of Red-Footed Boobies and 200 pairs of Magnificent Frigate birds. Boobies mate for life and nest from February through July in mangrove trees within the sanctuary. A visit to The national Trust offices, located on Courts Road in George Town is a must for visitors. There are also restored sites such as the Bodden Town Guard House, Old Savannah Schoolhouse, Watlers Cemetery and the Herbarium and Insectarium. And not to exclude mentioning of the excellent gift shop, which helps fund the Trust. The National Trust is part of the largest area of untouched, old growth dry forest remaining on the island. This area of forest in the Grand Cayman are of international significance representing some of the last remaining examples of the Caribbean's dry, subtropical forest, which have been the target of particularly intense deforestation throughout the West Indies. The Mastic Trail is two miles long and the guided walk takes approximately two and a half to three hours. Walkers experience a fascinating exploration deep into Cayman's wild interior, where the woodland has been evolving undisturbed for the last two million years.